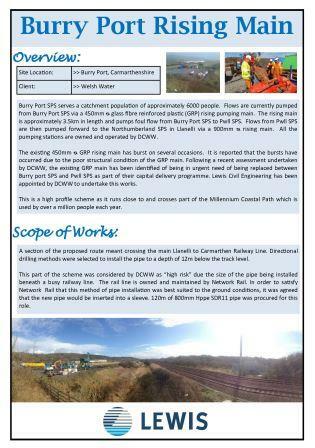 Burry Port SPS serves a catchment population of approximately 6000 people. 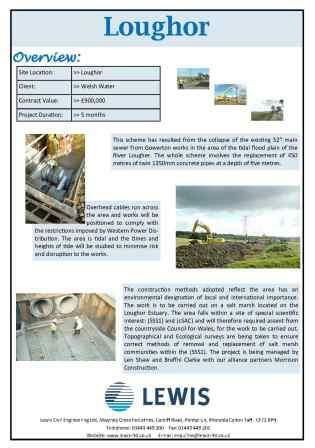 Work on this scheme involved installing a pipe to a depth of 12m below a busy railway line. Sewer upgrading: Gravity sewer by using auger boring techniques and the construction of six manholes. 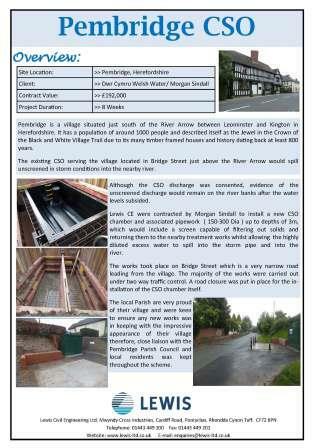 New Main Sewer Installation: Septic tanks overflowing causing pollution required the completion of a new Pumping Station and mains sewers for 57 dwellings. 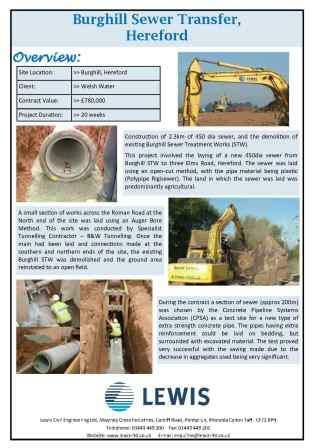 Main Sewer Replacement: The collapse of the existing 52" main sewer necessitated the replacement of 450m of twin 1350mm concrete pipe. 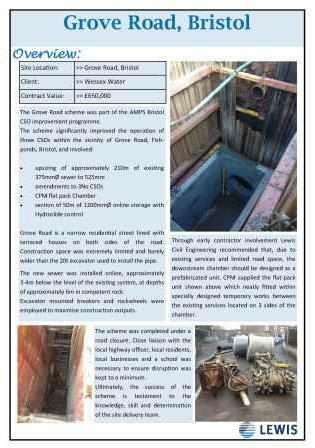 New Sewer Pipe and site clearance: Total site clearance of all contaminated material. New Sewer pipe laid. Located within the University Complex zone of Clifton in Bristol. A heavily populated area with both residential and lecture complexes associated with Bristol Uni. 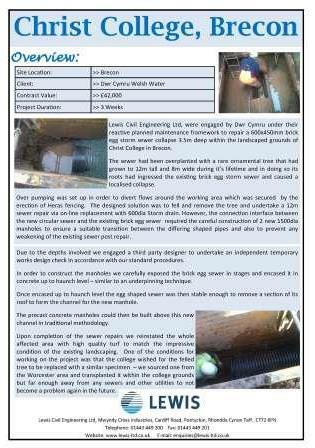 The repair a 600x450mm brick egg storm sewer collapse 3.5m deep within the landscaped grounds of Christ College in Brecon. 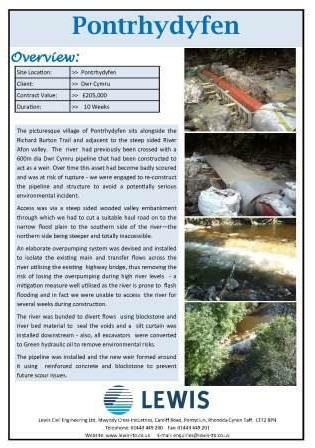 Although the CSO discharge was consented, evidence of unscreened discharge would remain on the river banks after the water levels subsided. 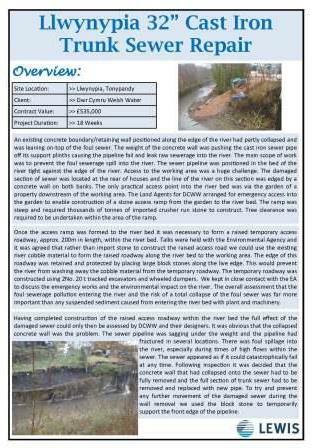 An existing concrete boundary/retaining wall positioned along the edge of the river had partly collapsed and was leaning on-top of the foul sewer. 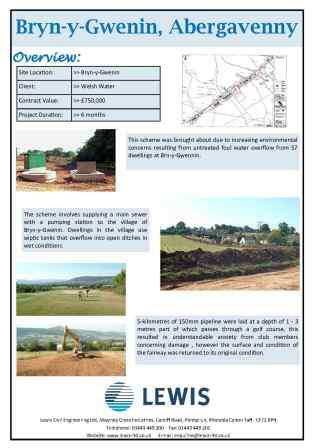 We were engaged on this scheme to re-construct a pipeline and structure to avoid a potentially serious environmental incident. 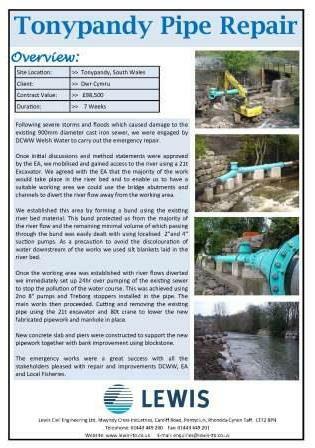 Following severe storms and floods which caused damage to the existing 900mm diameter cast iron sewer, we were engaged by DCWW Welsh Water to carry out the emergency repair. 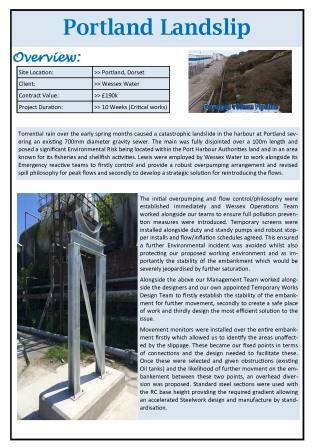 Torrential rain over the early spring months caused a catastrophic landslide in the harbour at Portland severing an existing 700mm diameter gravity sewer. The picturesque village of Pontrhydyfen sits alongside the Richard Burton Trail and adjacent to the steep sided River Afon valley. 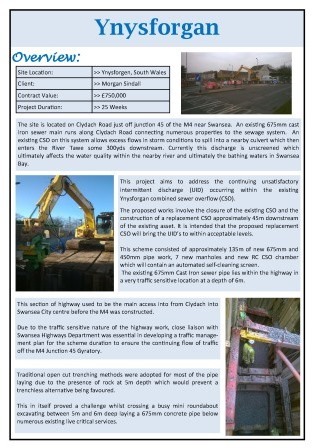 An existing 675mm cast iron sewer main runs along Clydach Road connecting numerous properties to the sewage system. 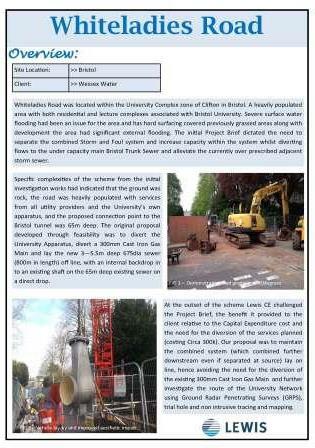 The Grove Road scheme was part of the AMP5 Bristol CSO improvement programme. 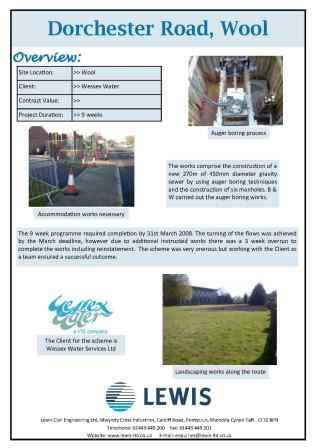 The scheme significantly improved the operation of three CSOs within the vicinity of Grove Road, Fishponds, Bristol.